Everyone is working on tight deadlines because brick and mortar retailers, online sellers, wholesalers, and manufacturers across the supply chain are trying to keep their inventories razor thin. Acquisition costs must be kept to a minimum, so ocean freight shipping is often the best solution. Keep reading. Meanwhile, if you’re new to the online Amazon “jungle,” you might be floating small margins to build your business. At the same time, you cannot have products arrive too soon or too late. Late shipments lose sales, so air freight shipping might be right for you. Choosing between shipping by ocean freight vs. air freight can be more complicated than it sounds, here are some questions and answers that might help. Q: If I ship by Ocean will my shipment make it in time for my customers’ or my own just-in-time deadlines? A: Great question. And many times, your freight forwarder is the best person to ask! There are certainly “standard” or “average” shipping times, but these can vary. Weather affects transit times, of course. 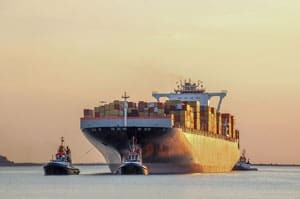 And while the Hanjin Shipping bankruptcy is an example of a well-publicized delay, port strikes and other events affect ocean freight shipping as well. Q: If I ship by Air won’t it be more expensive? A: Maybe, maybe not! See below. Q: Can I still get FBA products to Amazon in time to resell for the 2018 holiday season? A: IF YOU ALREADY HAVE AN ACCOUNT, yes. It depends on what and where you’re importing from and many other factors. In this instance, air freight might be your best bet. Our experienced shipping specialists can answer all these questions and more. For general questions about importing to Amazon, here’s a good place to start: Amazon Import Checklist. We’ve helped many customers with shipping to Amazon, and we can help you avoid costly mistakes… and even help you keep from going broke! Below are some things to consider about air freight. Import shipping by air decreases shipping time and generally results in the superior condition of goods upon arrival, allows for greater inventory control for just-in-time manufacturing and stocking, and for certain commodities, lower shipping costs. How can this be? Historically shipping costs for air freight have been calculated based on the gross weight or actual weight in kilograms or pounds. But it’s not that easy these days. There are two kinds of weight calculations: 1) Gross weight or actual weight and 2) Dimensional weight. [More about both of these below.] As you can imagine, by charging only by actual weight, low-density packages become unprofitable for air freight carriers due to the amount of space they take up in an aircraft. For example, if a carrier charged the same for shipping a pound of feathers as they do for a pound of produce or electronics, it would be unprofitable. Feathers take up a lot more room. Yes, this sounds complicated, but because we have been in the business for over 20 years, we can help you make the very best choice for shipping your products to arrive in time for any time of the year at the best price. Shippers, especially new or nearly-new shippers would be wise to call us and experience our hands-on, personalized service. Even experienced shippers would be well advised to call for our guidance. Shipping regulations change all the time. And we are all dealing with international rules as well as domestic shipping guidelines! To see the other ways we can help, check out the various logistics services on our website to read about the many other reliable and innovative solutions we provide to get your goods to or from nearly any destination worldwide. We provide a unique personalized service that you will not find with other companies.